In the construction site construction materials like sand, aggregate are delivered to the site through truck, haiwa, dumper etc. 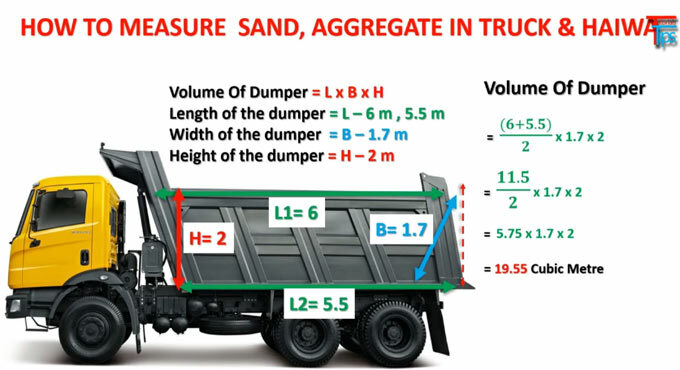 So, it is required to calculate the quantity of sand and aggregates in the vehicles. In the following construction video tutorial, you will learn some useful tips to calculate the quantity of sand, aggregate in truck, haiwa etc. The vehicles come in different sizes and shapes. Given below, the step-by-step procedures to calculate the quantity of materials in these vehicles. Here, length varies according to different types of vehicles. = 10/2 x 1.5 x 1.7 = 5 x 1.5 x 1.7 = 12.75 cubic meter. All the measurements should be taken from inside of the vehicles. In this way, the calculation can be done for other types of vehicles.